Sometimes, in a crowded week, there might be ten or twelve names we’d like to address for the birth date round-up, but space best permits about four, so here’s a handful of likeable players who share this writer’s own February birth-month. 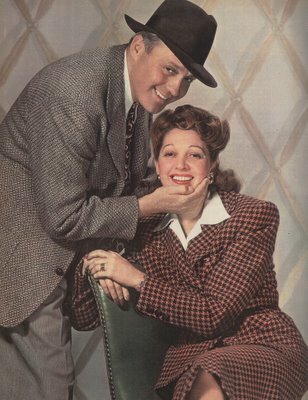 First up is Jack Benny (2-14), and this color shot shows he and wife Mary Livingstone in an early-forties pose. I do still maintain an unwavering opinion that Jack had the funniest ongoing comedy persona of all time. The fact that he mined it for well over forty years, without its becoming stale, is nothing short of miraculous. Even his last NBC specials from the early seventies are gems. Too bad we can’t see those anymore. I used to have a video of a Benny show, I think it’s from around 1954, where his guest was Humphrey Bogart. Amazing. 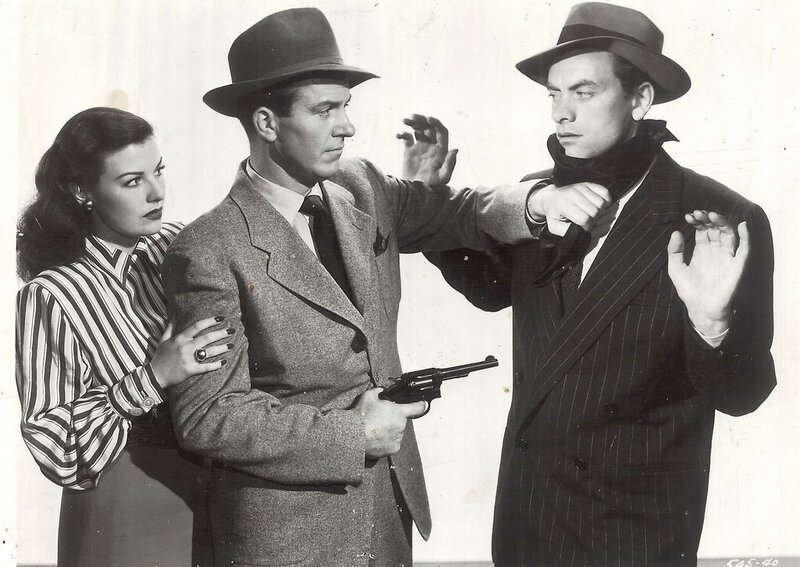 Despite his near elder-statesman status in the business, Bogie still reverted back to the public image his audience knew best --- Duke Mantee --- for his comedy sketch with Jack. That gangster thing followed him to the very end. Well, so did Jack’s miser tag, even though he was well-known off-stage for his generosity, and for being a nice guy in a comedy jungle where a lot of our most "beloved" names were real bastards as soon as the lights went down. Not Jack. Now honestly, was there ever an actor who projected more sincerity than Hugh Beaumont (2-16)? I’m not even sure it was acting. Maybe all the stuff that was happening to Ward Clever was really happening to Hugh, and we just didn’t realize it at the time. That’s how good he was. Total conviction, and he really seemed to listen to other actors when they spoke. So why didn’t his feature career take off? Well, he wasn’t bigger than life, for one thing. Not the movie star type, exactly. As it turned out, the family sitcom was ideal for him, but I wonder if Hugh wanted more. He didn’t work much after Beaver --- I'll never forget one time on Medical Center, the O.R. door opened, and in walked Hugh, with white hair! Did the producers of that show have any idea of the effect that iconic face would have after what was then a seven-year absence? I don’t recall anything else about that episode, but I sure remember that moment. Hugh ended up in Spartanburg, SC, living with his son, I think. Close enough that I could have looked him up. Bet he would have been very gracious. What a shame he just missed the Beaver reunion TV movie. Lousy as that turned out to be, it could have sure used his reassuring presence. By the way, this still is from Anthony Mann’s Railroaded, a crackerjack noir that’s available on DVD. That’s Mrs. Pat Buttram (Sheila Ryan) and John Ireland with Hugh. Here’s Ann Sheridan (2-21) lounging on a bear skin rug at Warners. She said years later that she hated that rug. It was tatty, and smelled real bad. Guess it’s kinda hard to machine wash those things, and would a dry cleaners accept them? The ones around here wouldn’t. Anyway, Annie was one of those gals that smoked her lunch every day. Cagney used to watch her at the commissary and be fascinated. She’d order a plate of scrambled eggs, then push them around with her fork as she went through a chain of fags, lighting one after another despite Jim’s health warnings. Well, that’s what got her in the end, of course, that and the alcohol. She’s one of those actresses that really aged quick. By the fifties, it was more or less character work for her, but there were still good ones (ever see Come Next Spring?). One of these days we’ll have to do a Monday Glamour Starter for her. 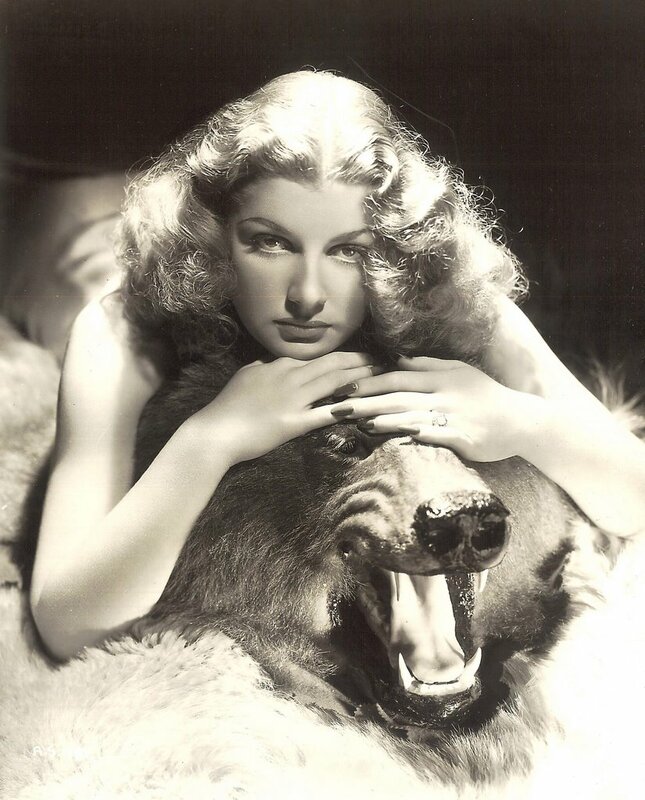 Now that I think of it, why didn’t she do more pictures with Howard Hawks? They would have been a perfect team. At the risk of sounding too autuerish here, I think her performance in Torrid Zone is very Hawksian. 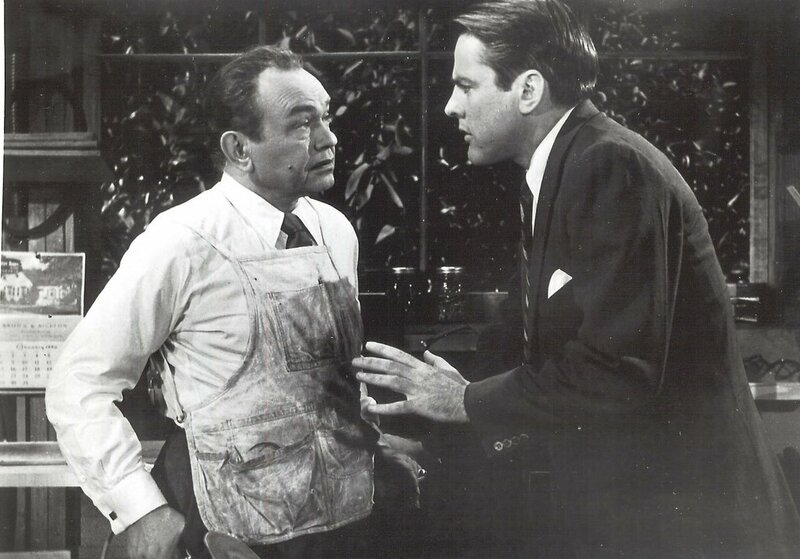 I promised myself I wouldn’t use a Kevin McCarthy (2-15) still from Invasion Of The Body Snatchers, and this nice shot of he and Eddie Robinson from Nightmare is the fulfillment of that solemn pledge. Kevin’s great, of course, and blessed be, he’s still with us. I actually got to spend some time with him back in 1989, when he came to our little NC village with his Harry Truman one-man show. We drove to and from the Greensboro airport together, and had dinner at the Holiday Inn. He was terrific. I’d met a few celebrities before, but never had I spent so much time around one. He regaled me with stories about the making of Hotel (Merle! ), Kansas City Bomber, and, of course, the pod movie. What a great experience. Of all the big names this country boy ever encountered (and there haven’t been that many), Kev was by far the nicest. Happy birthday, sir! Jack Benny was the funniest solo comedian ever -- always will be. The highlight of Bogart's appearance on the Benny show was when their sketch morphed into a Lucky Strike commercial -- and Bogie sang the jingle, never once breaking character. Unforgettable. I forgot to add to my previous comment... Hugh Beaumont was a minister, and took acting roles to finance his church. Funny how he started off as film noir heavies (even when playing the good guy) and wound up as America's dad. Excellent shots. Whenever anyone brings up Ann Sheridan, I think of her hash-slinger waitress in "They Drive by Night" fending off lecherous truckers with one-line zingers. Imagine that movie in the hands of Howard Hawks! Thanks for mentioning Kevin McCarthy. Few people remember he played Marilyn Monroe's husband in "The Misfits". "Nightmare" gave me the creeps when I saw it on TV back in the '60s. Written and directed by Maxwell Shane, it was based on a story by Cornell Woolrich. Shane had actually filmed it before in 1947 -- some scenes in both films are nearly identical -- as "Fear in the Night" with pre-'Bones' DeForest Kelley and Paul Kelly. A bit of Hollywood Babylonia as noted at the IMDb, Paul Kelly "spent 25 months in California's infamous San Quentin prison for beating to death Ray Raymond, the former husband of Dorothy Mackaye,an actress who would later become his second wife (judged an accomplice for withholding information, she herself was briefly imprisoned)." Wow... Mary Livingston was quite the looker back in the day, wasn't she? You GO, Jack. I'd have thrown a pass at her at the May Company, too, even if Kate Bradley and Doris Ziffle were hanging around. Seriously, I could look at a still picture of Jack Benny and crack up... ranks with W.C. Fields and Laurel & Hardy as the funniest guys I can think of. Hadn't you better oughtta be posting some L&H and more Fields stuff one of these days??? Love your blog, by the way, and read it religiously (whatever that means). I'm firmly of the opinion that no one was ever funnier than Benny. The video of the terrible sketch featuring him, Hope, and Rosie Clooney, with Benny finally ad libbing "This is the lousiest thing I was ever in!" is one of my favorite moments ever. Mary Livingston was quite funny, especially in the Benny radio shows. He always gave his cast the funniest lines in every script..
Benny didn't need funny lines. A man who can get laughs by being completely silent on the radio, or simply by staring at a tv camera, can afford to be generous. A neat novelty is the Mercury Theatre on the Air's broadcast of the play June Moon, with Jack Benny, Orson Welles, Benny Rubin and Bea Benederet. Jack is completely out of his standard character yet still funny while being warm and engaging. Well, of course Benny was warm and engaging; he was a "great, great actor." I can only imagine what he would have done in The Sunshine Boys.